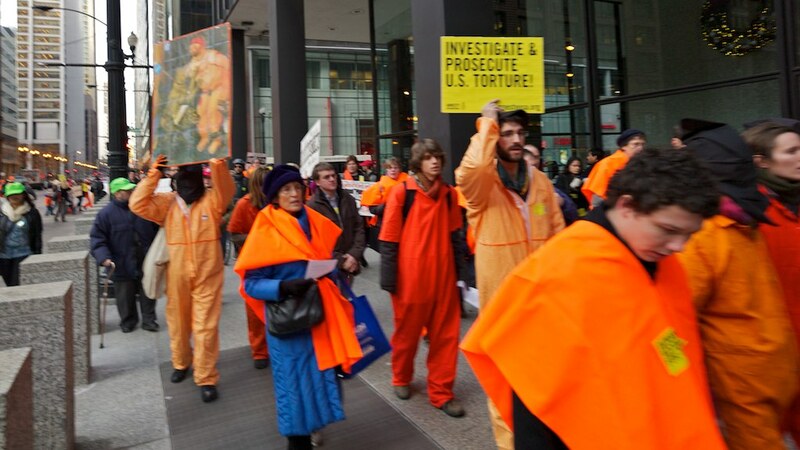 Chicago Protests 10 Years of Guantanamo, Indefinite Detention and Torture! 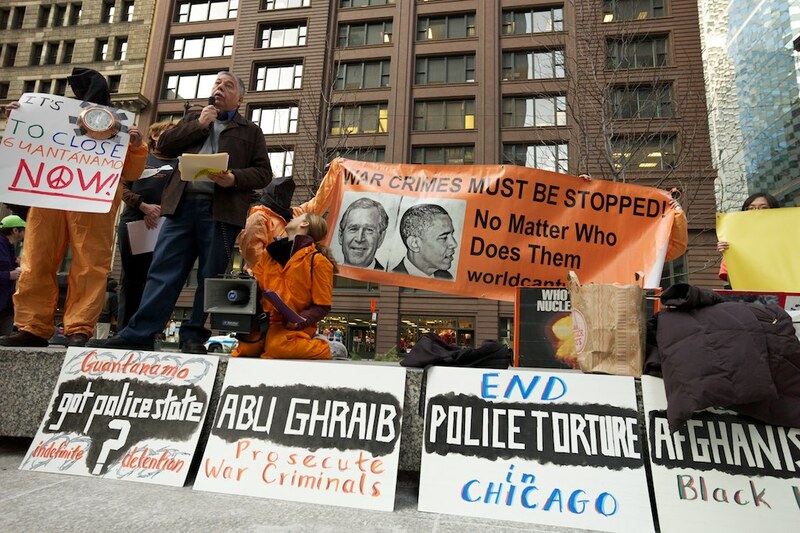 Program emcee Jay Becker from Chicago World Can’t Wait kicked off the program by explain that this is a day for protesting indefinite detentions, unfair trials, and torture. 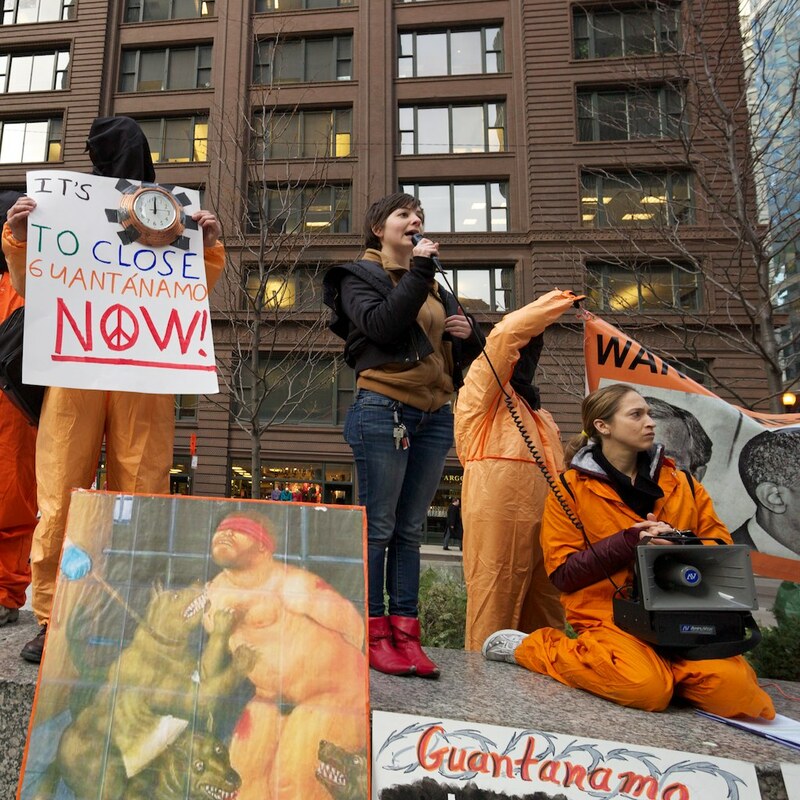 Guantanamo Bay Detention Center — which as of January 11, 2012, has been in operation for ten years — is just the clearest sign of how this is carried out by the U.S. today. 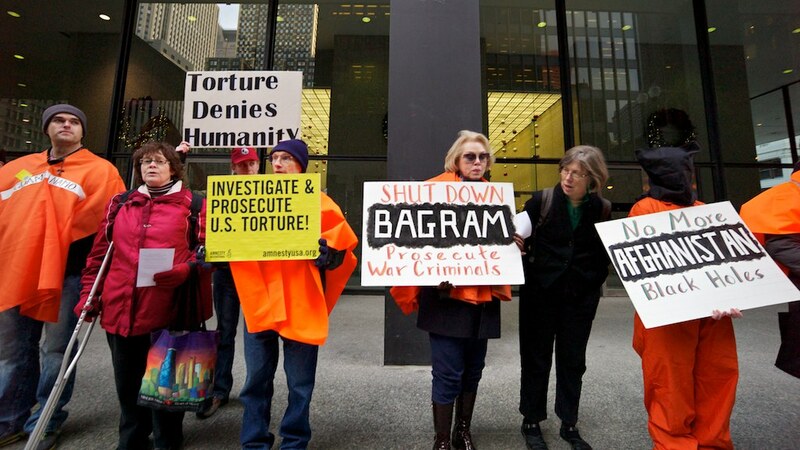 Today’s protest also addresses detention in Bagram and elsewhere in Afghanistan, as well as countless black sites; ICE detention of the undocumented; mass incarceration and torture via solitary confinement and sensory deprivation; and other illegitimate practices. 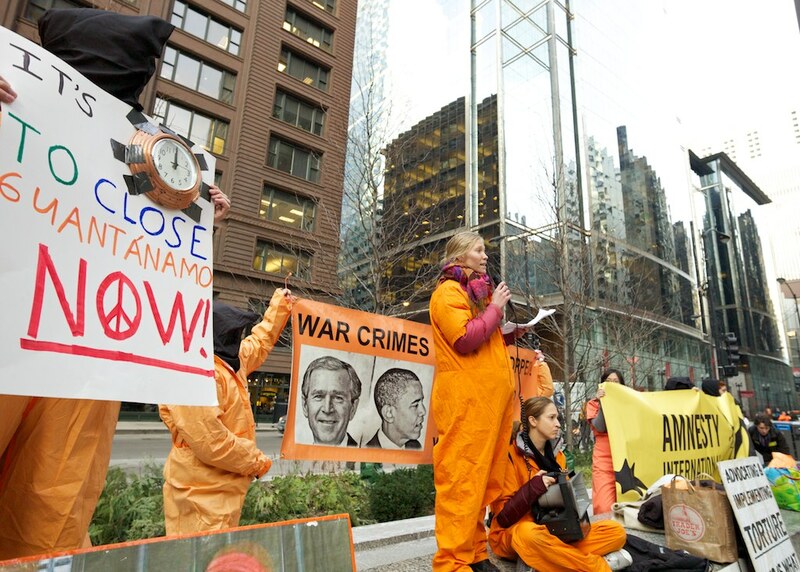 The rally continued with two speakers who laid the foundation for understanding how the U.S. has become a country of indefinite detentions, unfair trials, and torture. Mario Venegas, an activist who works with Amnesty International and is himself a survivor of torture in Pinochet’s Chile, talked about the legacy of U.S. sponsored detention and torture around the world. He stressed the way the U.S. has institutionalized the practice of torture around the world through the training it has provided for decades at the School of the Americas (SOA) in Ft. Benning, Georgia. He said his own torturers were trained at the School of the Americas; the name has changed but the terror it spreads continues. 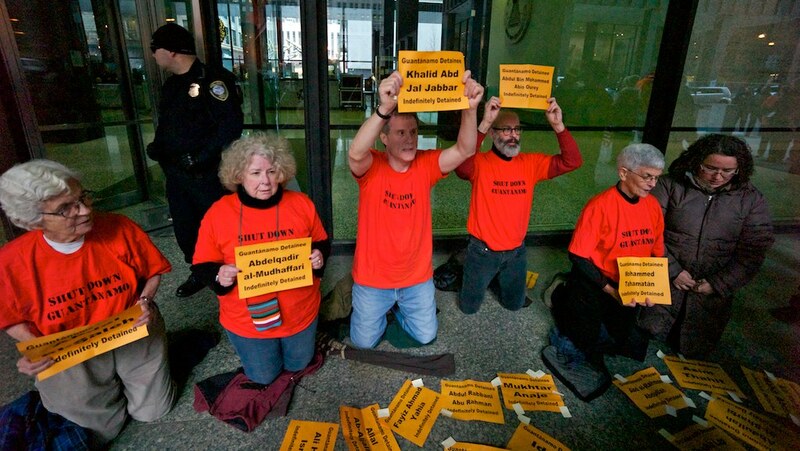 Two additional speakers explained just how pervasive the practices of indefinite detention, unfair trials, and torture have become in the U.S. today. 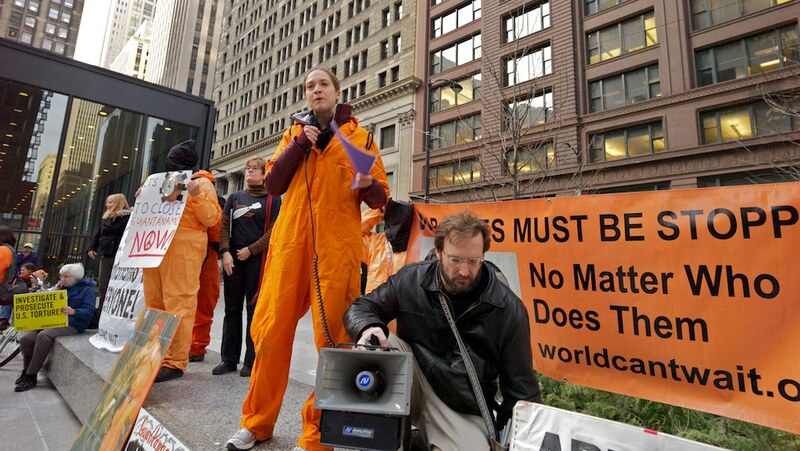 Ashley Bohrer, from Occupy Chicago, talked about the latest developments in U.S. detention, including the National Defense Authorization Act (NDAA) signed into law by Barack Obama on New Year’s Eve. 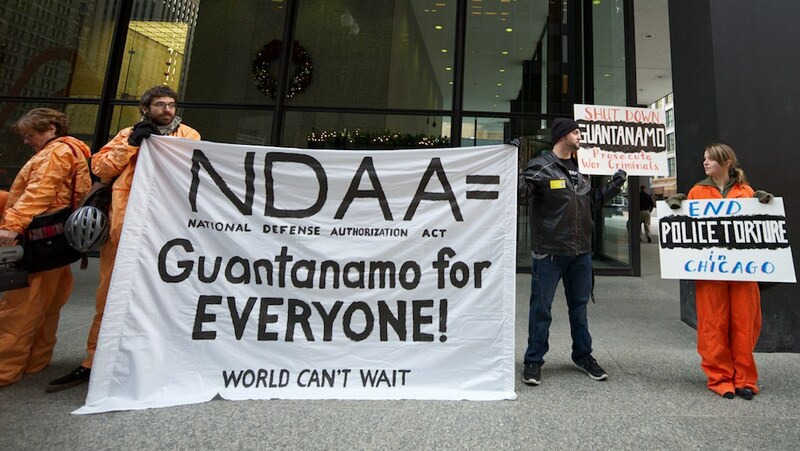 The NDAA provides for detention of ANYone, ANYwhere, ANYtime — including any U.S. citizen — on the say-so of the federal government. 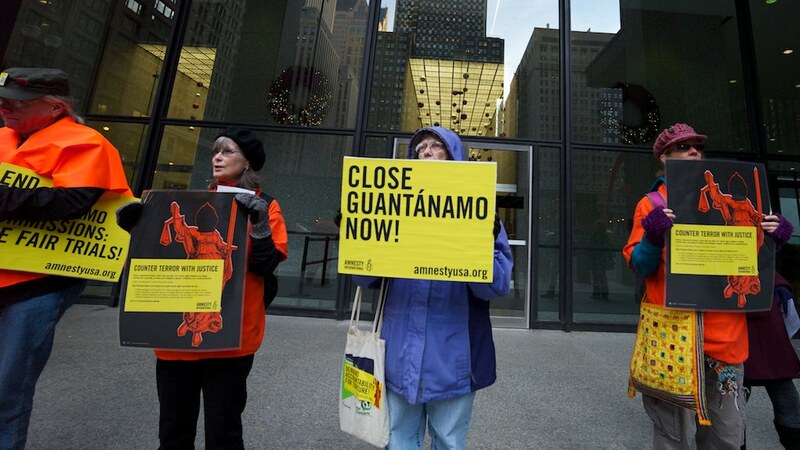 (As a banner at the protest stated: “NDAA = Guantanamo for EVERYONE!”) This is a clear threat to anyone who expresses political opinions and dissent — including (but certainly not limited to) the Occupy movement! 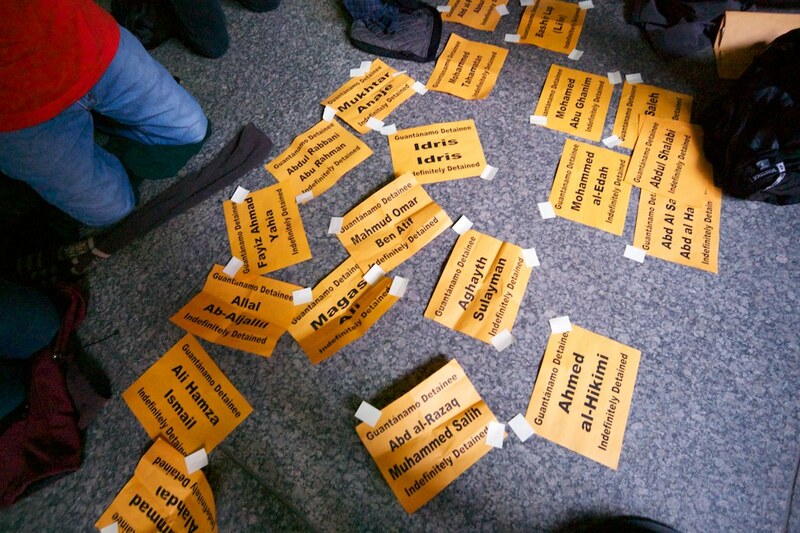 We then turned to the most important part of the program: explaining what we ALL can (and must!) 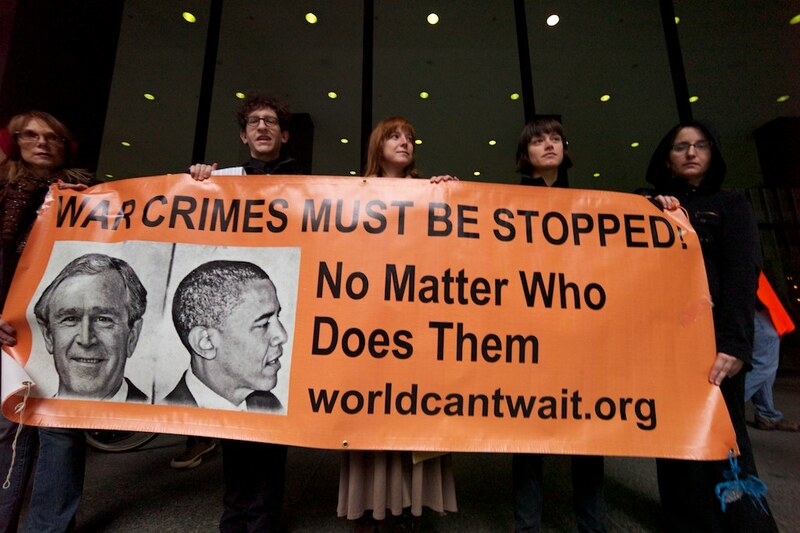 do to ACT to stop indefinite detention, unfair trials, and torture. 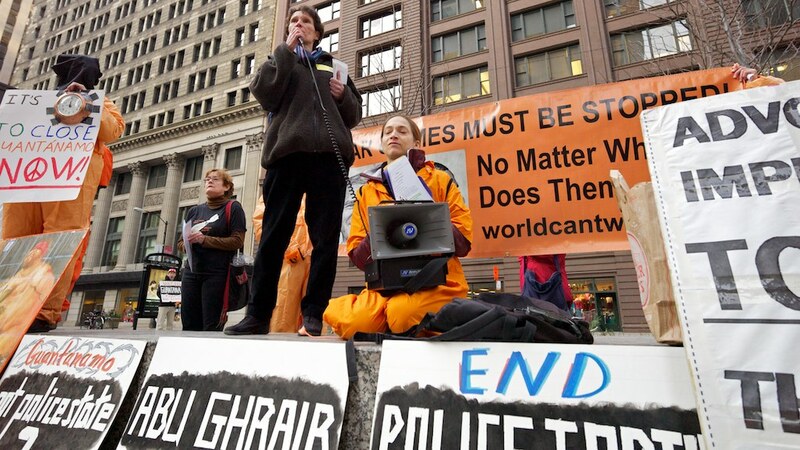 First, Erin Cox from the 8th Day Center for Justice exhorted everyone to support the Illinois Coalition Against Torture (ICAT) campaign to get Chicago City Council to adopt a resolution making Chicago a “torture-free city.” She explained that people should attend hearings, contact alderman, and rally at the January 18 City Council meeting to demand passage of this important resolution! 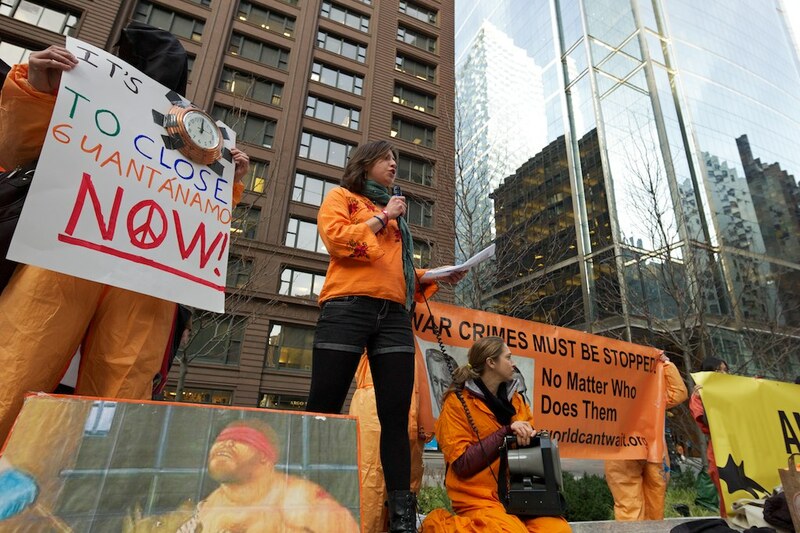 Next, Amnesty International Midwest Director Debra Erenberg talked about the work needed to end solitary confinement, including at supermax prisons like Tamms in Illinois; abolish the death penalty; and reform other domestic detention practices. 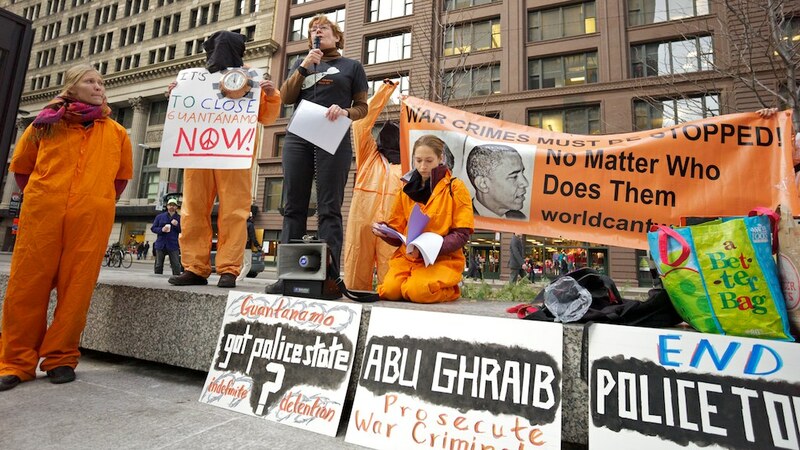 Third, Regina Rust Bambrick of Chicago Witness Against Torture and the White Rose Catholic Worker in Chicago called for the closure of Guantanamo and the release of all who are held there without charge.